Today the Elders are going on a field trip. After all it's the 4th... or is it the Queen's Birthday... or... never mind. It's a nice day outside and you want to find some fun. But there are a few obstacles to overcome. The doctor, nurses, and the rest of the staff don't understand fun. And they don't allow any unauthorized excursions. Besides, you can't remember any exit locations! 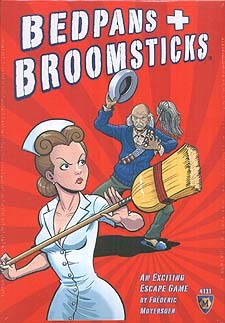 In Bedpans and Broomsticks, you and up to 3 other players become desperate Elders of Shady Pines. You are all trying to exit the building. A fifth player controls the Staff of doctors, nurses, and orderlies... all trying to "keep you safe."